The effect of cold exposure on the systemic renin-angiotensin system and on regulation of the angiotensin II (Ang II) receptor was examined in target organs for Ang II with cardiovascular relevance (left ventricle, kidney, lung) and metabolic relevance [interscapular brown adipose tissue (ISBAT), liver] to the functional consequences of cold exposure. In time course studies, the effects were examined of 4 hr or 1, 3 and 7 days of exposure to cold (4°C) on plasma Ang II concentration and Ang II receptor binding characteristics in rat liver. Plasma Ang II concentration increased 10-fold after 4 hr of cold exposure, returned to control levels at days 1 and 3 of cold exposure, and was again increased (2-fold) at 7 days of cold exposure. The affinity of [125I]Sar1,Ile8-Ang II binding in membranes prepared from rat liver was not altered in cold-exposed rats. The density (Bmax) of binding sites in liver from cold-exposed rats was increased by day 1 and remained elevated over time-matched controls. Alterations in Ang II receptor density did not parallel plasma Ang II concentration in their time course, suggesting that cold-induced regulation of the Ang II receptor was not substrate mediated. In rats from the 7-day time point of cold exposure, Ang II receptor binding characteristics were examined in ISBAT and lung. Increases in Ang II receptor density were evident in ISBAT but not lung. To determine whether cold-induced increases in food intake contributed to elevations in plasma Ang II concentration and/or Ang II receptor density, a group of cold-exposed rats (7 days) were pair-fed to food intake levels of control rats. Pair-feeding of cold-exposed rats eliminated increases in plasma Ang II and norepinephrine concentration but did not prevent increases in Ang II receptor density in liver, ISBAT, kidney and left ventricle. Moreover, increases in Ang II receptor density were augmented in kidney and left ventricle from cold-exposed rats that were pair-fed. Results from these studies demonstrate that cold exposure resulted in an increase in plasma Ang II concentration through mechanisms related to increased food intake. Elevations in food intake in cold-exposed rats contributed to tissue-specific increases in Ang II receptor density. Moreover, cold-induced increases in Ang II receptor density were not related to plasma Ang II concentration. Cold exposure is a well-documented stimulus for activation of the sympathetic nervous system (Saito, 1928; Leduc, 1961). After prolonged exposure of rats to cold, a sustained increase in systolic pressure occurs, giving rise to a cold-induced model of hypertension (Freglyet al., 1989). Activation of the sympathetic nervous system is thought to contribute to the development of hypertension in cold-exposed rats (Papanek et al., 1991). Sympathetic input to the kidney increases the release of renin, which in turn contributes to the production of Ang II. Several lines of evidence suggest activation of the renin-angiotensin system in response to cold exposure. Experimental hypertension in cold-exposed rats is associated with enhanced responsiveness to the dipsogenic effect of Ang II (Fregly et al., 1991). Moreover, pharmacological interference with the renin-angiotensin system with angiotensin-converting enzyme inhibitors (Shechtman et al., 1991) or AT1 receptor antagonists (Freglyet al., 1993) has been demonstrated to prevent increases in systolic blood pressure in cold-exposed rats. Previous studies in our laboratory demonstrated that after 7 days of cold exposure, plasma renin activity was not altered, whereas Ang II content was elevated in ISBAT (Cassis, 1993). ISBAT has been shown to be activated by the sympathetic nervous system after cold exposure (Young and Landsberg, 1982). Moreover, the presynaptic facilitatory effect of Ang II on sympathetic neurotransmission in ISBAT from cold-exposed rats was augmented, suggesting alterations in the functional responsiveness of the angiotensin receptor (Cassis, 1993). Collectively, these results suggest coincident activation of the sympathetic nervous system and the renin-angiotensin system in response to cold exposure. We hypothesize that cold exposure represents a model of heightened activity of the systemic renin-angiotensin system resulting from increased sympathetic activation. Increases in the activity of the systemic renin-angiotensin system after cold exposure are hypothesized to result in regulation of the angiotensin receptor. In the present study, plasma Ang II concentration and Ang II receptor binding characteristics were examined in target organs for Ang II with cardiovascular relevance (left ventricle, kidney, lung) and metabolic relevance (ISBAT, liver) to the functional consequences of cold exposure. The following studies determined whether cold exposure regulates the systemic renin-angiotensin system, whether plasma Ang II concentration correlates to Ang II receptor density, whether cold exposure results in tissue-specific regulation of Ang II receptor density and whether cold-induced increases in food intake contribute to alterations in plasma Ang II concentration or Ang II receptor density. In time course studies, alterations in Ang II receptor binding characteristics were examined in liver membranes from rats exposed to cold for different time periods (4 hr or 1, 3, 5 and 7 days; n = 5/group, cold-exposed and control rats at each time period). Comparisons were made between cold-exposed and control rats within a time period. The liver was chosen for study in these experiments due to its relative high density of Ang II receptor sites. From these studies, a time point (7 days) was chosen representing maximal cold-induced alterations in liver Ang II receptor density. Additional tissues (ISBAT and lung) then were examined for Ang II receptor binding characteristics in 7-day cold-exposed and control rats. In a separate study, cold-exposed rats were pair-fed to control rat food intake levels to determine the effect of increased food intake on Ang II receptor binding characteristics. Three groups of rats were studied for a period of 7 days, (1) control rats fed ad libitum (n = 6), (2) cold-exposed rats fed ad libitum (n = 6), and (3) cold-exposed rats that were pair-fed to the mean food intake level of control rats over the preceding 24-hr period (n = 6). Measurements of food and water consumption were obtained daily at 10:00 a.m. Male Sprague-Dawley rats (250–300 g, Harlan Laboratories, Indianapolis, IN) were used in all studies. All rats were housed two per cage in the animal quarters for 1 week on arrival. Preceding the experimental protocol, all rats were given free access to food and water, were maintained under a 12-hr light/dark cycle and were housed at ambient room temperature (23°C). For the cold exposure experimental protocols, rats were housed at 4°C in an animal hibernactim facility located in the Veteran’s Administration Research facility at the University of Kentucky. Cold-exposed rats were housed individually in cages beginning at study day 1 (first day of cold exposure), with controlled humidity (79%) and a 12-hr light/dark cycle. Control rats were housed in individual cages for the duration corresponding to cold exposure. For all studies, rats were fed standard rat chow. Measurements of food intake were obtained by providing 50 g of standard rat chow to the cage, followed by weighing the remaining food (food intake was corrected for spillage) 24 hr later. Water intake was measured by filling leak-proof water bottles with premeasured amounts of fresh water (500 ml/day), followed by measuring the water remaining in the bottle 24 hr later. In the time course study, binding characteristics for the Ang II receptor were examined in membranes prepared from livers of cold-exposed and time-matched control rats. Ang II receptor binding characteristics were also determined in ISBAT and lung from 7-day cold-exposed and control rats. In the pair-feeding study, Ang II binding assays were performed using membranes prepared from liver, ISBAT, kidney and left ventricle from control rats fed ad libitum, cold-exposed rats fed ad libitum and cold-exposed pair-fed rats. Tissues were removed, homogenized in membrane buffer (0.25 M sucrose/50 mM sodium phosphate, pH 7.2) and centrifuged for 30 min at 48,000 × g (4°C) (Lu et al., 1995). The pellet was rehomogenized, washed and centrifuged additionally 3 times. The final pellet was resuspended (1 mg protein/ml for each tissue) by homogenization in 50 mM sodium phosphate (pH 7.2). The crude membranes were frozen and stored at −70°C until use. For Ang II receptor binding saturation isotherms, [125I]Sar1,Ile8-Ang II (specific activity, 2,176 Ci/mmol; radiolabeled by Dr. Robert Speth at Washington State University) was used as a nonselective Ang II receptor antagonist to radiolabel the receptor sites. Initial experiments determined an amount of membrane protein representing the linear portion of a membrane protein curve (liver, 20 μg of protein; ISBAT, 150 μg; lung, 50 μg; kidney, 100 μg) for [125I]Sar1,Ile8-Ang II binding. Saturation binding isotherms in all tissues except ISBAT were performed by incubating duplicate aliquots of membrane protein with a fixed concentration of [125I]Sar1,Ile8-Ang II radioligand (0.5 nM) and increasing concentrations of unlabeled Ang II (0.1 nM to 0.5 μM) in binding assay buffer (50 mM sodium phosphate, 0.1 mM EDTA, 0.014% bacitracin, 0.2% fatty acid free bovine serum albumin; pH 7.2) for 60 min at 26°C. For ISBAT, saturation binding isotherms were performed with increasing concentrations of [125I]Sar1,Ile8-Ang II (1 pM to 10 nM). Nonspecific binding was determined in duplicate by incubating membranes with [125I]Sar1,Ile8-Ang II and an excess (10 μM) of unlabeled Ang II. After incubation the samples were filtered (Brandel Cell Harvester) through Whatman GF/B glass fiber filters presoaked in a 0.2% bovine serum albumin solution. The filters were washed three times, and the radioactivity was determined by counting in a gamma counter (70% efficiency of counting for [125I]). Kd and Bmax (normalized to mg of protein) values were derived using LIGAND software. For competition studies, liver membranes were incubated with [125I]Sar1,Ile8-Ang II (0.5 nM) in the presence of increasing concentrations (0.1 nM to 10 μM) of the AT1 receptor antagonist losartan for 60 min at 26°C. The inhibitory constant (Ki ) was calculated from the IC50 value using the equation of Cheng and Prusoff (1973). Trunk blood was collected into vacuum test tubes containing the following buffer: pepstatin A, 0.15 mM; phenanthroline, 20 mM; EDTA, 125 mM; neomycin, 0.2%; ethanol, 2%; DMSO, 2%; and renin inhibitor kallikrein, 0.1 μM, pH 7.4. The inhibitors in this buffer were added to eliminate breakdown of angiotensin peptides as well as further production of peptides during sample handling (Campbell et al., 1995). Plasma was obtained by centrifugation (3000 × g) of blood at 4°C for 30 min. Plasma samples were partially purified using SepPak C-18 column chromatography (Waters, MA) with the columns preequilibrated with 4 ml methanol, 4 ml water and 10 ml buffer. Angiotensin peptides were eluted from the columns with 2 ml of methanol/water/TFA (70:29:1). The eluate was evaporated overnight using a SpeedVac (Savant). Plasma angiotensin peptides were measured in preextracted samples that were reconstituted in 100 μl of Ang II RIA buffer (0.1 M K2HPO4, 3.0 mM EDTA, 0.15 mM 8-hydroxyquinoline, 0.25% bovine serum albumin; pH 7.2), sonicated for 5 min and stored at −20°C. Angiotensin peptide concentration in each sample was measured by Ang II RIA using a polyclonal Ang II antibody (kindly supplied by Dr. A. Freedlender, University of Virginia) exhibiting minimal cross reactivity to Ang I (2%) and angiotensin5–8(A5–8) (4%) but 100% cross reactivity to angiotensin2–8 (Ang III), angiotensin3–8 (A3–8 or Ang IV) and angiotensin4–8(A4–8). The sensitivity of the RIA for angiotensin was 2 pg/ml. To determine the catabolic profile of plasma angiotensin peptides, an aliquot of plasma from 7-day cold-exposed rats was reconstituted in 100 μl of mobile phase buffer A (25 mM phosphate buffer with 5% acetonitrile, pH 7.6) and resolved by reverse-phase HPLC analysis using a system composed of a Beckman NEC controller, Beckman model 125 binary gradient pump, a model 166 variable wavelength UV detector (200 nm) and a Beckman reverse-phase ultrasphere (5 μm) C18 analytical column (4.6 × 250 mm in length). The HPLC system was coupled to a Gilson model FC204 fraction collector for sample collection (1-min collection interval). Elution was by a nonlinear gradient (from 9% to 30% buffer B (95% acetonitrile) over 45 min) starting with a mobile phase consisting of 89% buffer A and ending with buffer B at a flow rate of 1.5 ml/min. Retention times of standards for Ang II and other angiotensin peptides (A2–8, A3–8, A4–8 and A5–8) were used to identify angiotensin peptides in individual HPLC fractions. Individual HPLC fractions from each plasma sample were collected (total of 16 fractions analyzed by RIA per sample) and evaporated in a SpeedVac concentrator overnight. HPLC fractions were reconstituted in 250 μl of RIA buffer and analyzed for angiotensin peptide concentration by RIA. The recovery of Ang II standard over the extraction procedure (SepPak C18 extraction, HPLC analysis) was 70%. Reported angiotensin peptide concentrations in plasma were not corrected for recovery. Blood was obtained as described, and an aliquot (500 μl) of plasma was removed for measurement of plasma leptin levels. Plasma concentration of leptin was measured using a commercial RIA kit (Linco Research, MO) with a rat leptin antibody. The sensitivity of the kit for rat leptin was 0.5 ng/ml and required 100 μl of rat plasma for assay. The reverse-phase HPLC system consisted of a System Gold Module 116 pump (Beckman), a model 7725 injection valve fitted with a 50-μl sample loop (Rheodyne, Cotati, CA), a Coulochem model 5100A electrochemical detector (ESA, Bedford, MA) and model 5011 analytical cell (ESA) and a catecholamine HR-90 reverse-phase column (ESA) packed with 3-μm spherical silica bonded with octadecylsilane with a graphite guard filter. HPLC chromatograms were displayed on an Omniscribe chart recorder (Houston Instruments, TX). The mobile phase (flow rate of 1.0 ml/min) consisted of 70 mM citric acid anhydrous, 0.16 mM EDTA, 100 mM l-octane sulfonic acetate trihydrate, 11 mM NaCl and 4.5% (v/v) methanol, pH 4.0. The HPLC column was equilibrated with mobile phase for 12 hr before use. Free catecholamines were extracted from plasma as follows: 250 μl plasma was added to 25 mg of activated alumina, 1 ml of 0.45 μm-filtered Tris·HCl (1.5 M Tris·HCl, 0.5 mM EDTA and 0.4 mM sodium metabisulfite, pH 8.7) and 400 pg of DHBA as internal standard. After the addition of alumina, the samples were vortexed for 10 min, interrupting every 2 min to allow the alumina to settle. The alumina mixture was washed three times with 3-ml portions of 50-fold dilutions of ice-cold Tris·HCl and water. The supernatant was removed, and the alumina slurry was transferred to microfilter tubes and centrifuged at 3500 rpm for 1 min. The supernatant from this centrifugation was discarded. Catecholamines were eluted from the alumina by the addition of 100 μl of 0.1 M perchloric acid, vortexing for 10 sec followed by centrifugation at 3500 rpm for 1 min. Extracts (50 μl) were injected onto the HPLC for catecholamine analysis. A set of catecholamine standards (NE, DHBA, Epi; 5–600 pg) were used to determine plasma catecholamine content with the DHBA content in extracts used to correct for recovery through the alumina extraction procedure. Statistical analysis of Ang II receptor density in livers from cold-exposed and control rats was performed at each time period by unpaired t test. Statistical analysis of the characteristics of cold-exposed rats (body weight, organ mass, plasma leptin levels) were also performed by unpaired t test. In the pair-feeding study, receptor binding data was analyzed by one-way ANOVA followed by Tukey-Kramer multiple comparisons test for post-hoc analysis. Food intake, water intake and body weight in the pair-feeding study were analyzed by one-way ANOVA with repeated measures, followed by Tukey-Kramer multiple comparisons test for post-hoc analysis. In the time course study, at 7 days of cold exposure, body weight was significantly decreased in cold-exposed rats compared with control (control, 340 ± 5; cold-exposed, 323 ± 5 g; P < .05). In the pair-feeding study, body weights were significantly decreased in both groups of 7-day cold-exposed rats compared with control rats (control fedad libitum, 305 ± 4; cold-exposed fed ad libitum, 273 ± 3; cold-exposed, pair-fed, 246 ± 2 g, P < .05). Moreover, body weights of cold-exposed rats that were pair-fed were significantly decreased from cold-exposed rats fedad libitum. The time course for alterations in body weight and food intake were monitored throughout the experimental pair-feeding protocol and demonstrated a decrease in body weight in cold-exposed rats fed ad libitum and cold-exposed pair-fed rats compared with controls by day 5 (fig. 1A). 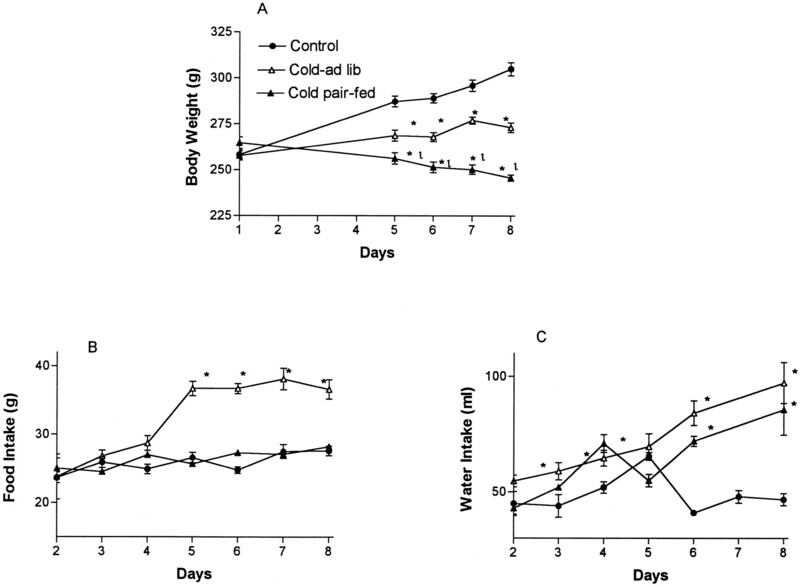 Food intake was significantly increased in cold-exposed rats fed ad libitum by day 5 (fig. 1B). Food intake of cold-exposed rats that were pair-fed was maintained at control rat levels throughout the experimental protocol (fig. 1B). Water intake increased in cold-exposed rats fed ad libitum rats by 1 day of cold exposure and remained elevated (fig. 1C). Pair-feeding cold-exposed rats to food intake levels of control rats did not prevent cold-induced increases in water intake. The time course for the effect of 7 days of cold exposure on (A) body weight, (B) food intake and (C) water intake. Three different groups of rats were examined, control rats maintained at ambient temperature and fed ad libitum, cold-exposed rats housed at 4°C fed ad libitum (Cold-ad libitum) and cold-exposed rats that were pair-fed to food intake levels of control rats (Cold pair-fed). A, The time course for the effect of cold exposure on body weight in the three groups. Cold exposure resulted in a time-dependent decrease in body weight inad libitum and pair-fed rats. The body weight of cold pair-fed rats was significantly decreased compared with cold rats fedad libitum and control rats. B, The time course for food intake demonstrated an increase in food intake by day 5 of cold exposure in ad libitum rats. Pair-fed rats that were cold-exposed were maintained at control rat food intake levels. C, Water intake increased significantly by day 1 of cold exposure. Pair-feeding cold-exposed rats did not prevent increases in water intake. Data are mean ± S.E.M. of n = 6/group. ∗, Significantly different from control. †, Significantly different from cold exposed. In the time course study, the mass of the ISBAT relative to body weight significantly increased by day 7 of cold exposure (control, 0.10 ± 0.01; cold, 0.18 ± 0.02, g % body weight, P < .05). In the pair-feeding study, after 7 days of cold exposure the mass of the ISBAT relative to body weight was increased to a similar extent in both groups (ad libitum, pair-fed) of cold-exposed rats compared with control (data not shown). Plasma angiotensin, NE and leptin concentration. In the time course study, angiotensin peptide concentration in plasma markedly increased (10-fold) in 4-hr cold-exposed rats compared with controls (table 1). Interestingly, at 1 and 3 days of cold exposure, plasma angiotensin peptide concentration was not significantly increased compared with controls; however, plasma angiotensin peptide concentration was again elevated (2-fold) above controls at day 7 (table 1). An aliquot of plasma from 7-day cold-exposed and control rats was further resolved by HPLC to determine the catabolic profile of angiotensin peptides, followed by quantification of individual angiotensin peptides by RIA (fig. 2). When resolved by HPLC, increases in angiotensin peptide concentration in plasma from cold-exposed rats were demonstrated to result from increased concentrations of Ang III (A2–8), Ang IV (A3–8) and smaller angiotensin peptides (A4–8, A5–8). 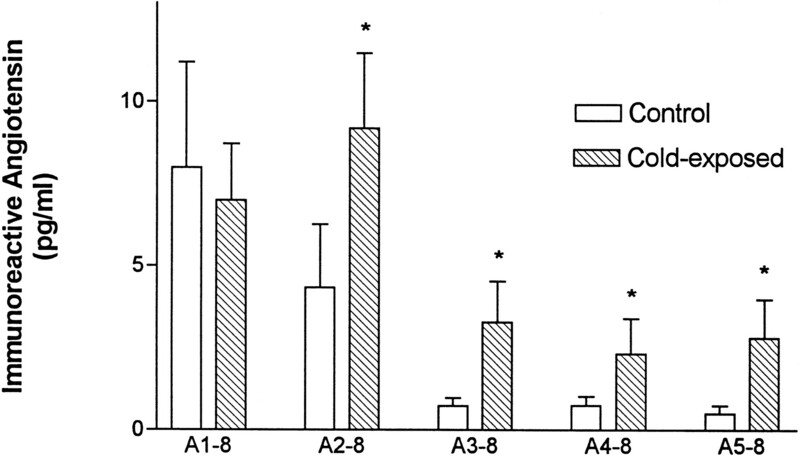 Plasma Ang II (A1–8) concentration was not increased in cold-exposed rats compared with controls (fig. 2). In control rat plasma, Ang II (A1–8) and Ang III (A2–8) comprised ∼41% and ∼38% of total angiotensin peptides in plasma, respectively (fig 2). The percentage of smaller angiotensin peptide fragments (all peptides except Ang II, expressed as a percent of total angiotensin peptides in plasma) was significantly greater in plasma from cold-exposed (71%) than control (52%) rats. Immunoreactive angiotensin peptides in plasma resolved by HPLC. Rats were maintained at room temperature (controls) or cold exposed for 7 days. Angiotensin peptides in HPLC fractions, including Ang II (A1–8), Ang III (A2–8), Ang IV (A3–8), A4–8 and A5–8, were quantified by RIA as described in the text. Plasma Ang II (A1–8) concentration was not increased in cold-exposed rats compared with control; however, concentrations of smaller angiotensin peptides (A2–8 to A5–8) were increased in plasma from cold-exposed rats compared with control. Data are mean ± S.E.M. from n = 6/group. ∗, Significantly different from control. In the pair-feeding study, plasma angiotensin peptide concentration was measured by extraction over SepPak C18 columns followed by RIA and demonstrated a 5-fold increase in angiotensin peptide concentration in 7-day cold-exposed rats fed ad libitum (fig 3A). Interestingly, pair-feeding cold-exposed rats to food intake levels of control rats totally eliminated cold-induced increases in angiotensin peptide concentration (fig. 3A). Plasma NE was measured by extraction over alumina followed by separation and quantification of plasma NE concentration using HPLC with electrochemical detection. Plasma NE concentration was increased (2-fold) in 7-day cold-exposed rats fed ad libitum compared with control (fig. 3B). Pair-feeding cold exposed rats to food intake levels of control rats totally eliminated cold-induced increases in plasma NE concentration (fig. 3B). Leptin concentration in plasma was also measured in rats in the pair-feeding study. After 7 days of cold exposure at 4°C, plasma leptin concentration was significantly decreased (61%) in pair-fed cold-exposed rats compared with control rats (fig. 3C). Decreases in plasma leptin concentration in cold-exposed rats fed ad libitum were not significantly different from control rats. Moreover, plasma leptin concentration in cold-exposed rats fed ad libitum was not significantly different from pair-fed cold-exposed rats. Plasma angiotensin peptide concentration (A), plasma NE concentration (B) and plasma leptin concentration (C) in rats from the pair-feeding study. Refer to figure 1 legend for description of experimental groups. Plasma angiotensin peptide concentration (A) was increased in cold-exposed rats fed ad libitum. Pair-feeding cold exposed rats eliminated increases in plasma angiotensin peptide concentration. Plasma NE (B) concentration was increased in cold-exposed rats fed ad libitum, with increases prevented by pair-feeding. Plasma leptin concentration (C) in cold-exposed rats that were pair-fed was decreased from control. Data are mean ± S.E.M. ∗, Significantly different from control. Characterization of Ang II receptor binding. In all tissues examined, [125I]Sar1,Ile8-Ang II bound to a single, high-affinity site. In the time course study, the affinity of binding was not significantly altered at any time period examined in livers from cold-exposed rats compared with controls (table2). Nonspecific binding ranged from <5% (liver) to 40% (left ventricle) and was similar in membranes prepared from tissues of rats from each group. In the time course study, at 4 hr of cold exposure, Ang II receptor density in the liver was not altered (table 2, fig. 4A). After 1 day of cold exposure, Ang II receptor density in the liver increased (2-fold) compared with controls (table 2, fig. 4B). Increases in Ang II receptor density in livers from cold-exposed rats compared with controls were also evident at 3 (2-fold) and 7 (3-fold) days of cold exposure (table2, fig. 4, C and D). In ISBAT, Ang II receptor binding density significantly increased (2-fold) in 7-day cold-exposed rats compared with control (table 3). In contrast, lung Ang II receptor binding density was not significantly altered after cold exposure (table 3). Scatchard analysis for [125I]Sar1,Ile8-Ang II binding in liver membranes from rats exposed to cold for different time periods. Rats were housed at 4°C for 4 hr (A), 1 day (B), 3 days (C) and 7 days (D) and given free access to food and water. Control rats were housed at ambient room temperature for an equivalent period of time. Membranes were prepared from rat liver, and saturation isotherms for [125I]Sar1,Ile8-Ang II binding were performed according to the text. Scatchard analysis demonstrated a significant increase in receptor density (Bmax, x-intercept) at the time points of 1, 3 and 7 days of cold exposure. The affinity of binding (slope) was not affected by cold exposure. Data are mean ± S.E.M. of n = 5 rats/group/time period. To determine whether alterations in the Ang II receptor subtype distribution occurred in response to cold exposure, competition displacement of [125I]Sar1,Ile8-Ang II binding by losartan was performed in liver membranes from cold-exposed (7 day) and control rats (fig.5). Losartan, in a concentration-dependent manner, completely displaced [125I]Sar1,Ile8-Ang II binding in liver membranes from control and cold-exposed rats. Moreover, the Ki value for losartan competition in liver membranes was not different between control and cold-exposed rats (control, 13.5 ± 1.7; cold exposed, 13.6 ± 2.6 nM). Competition displacement of [125I]Sar1,Ile8-Ang II binding by losartan in liver membranes from 7 day cold-exposed and control rats. Liver membranes were prepared from rats exposed to cold (4°C) or ambient temperature for 7 days. Competition displacement of [125I]Sar1,Ile8-Ang II (0.5 nM) binding from liver membrane aliquots with losartan (0.1 nM to 10 μM) demonstrated AT1 receptor distribution in liver, with a similarKi value for losartan competition in membranes from cold-exposed and control rats. Data are mean ± S.E.M. of n = 6 rats/group. In a separate study, the effect of pair-feeding cold-exposed rats to food intake levels of control rats on characteristics of Ang II receptor binding was examined after 7 days of cold exposure. In all tissues examined, [125I]Sar1,Ile8-Ang II bound to a single, high-affinity site, with no significant difference in the affinity of binding in tissues from cold-exposed (fedad libitum, pair-fed) and control rats (table4). In liver, the density of binding was increased (3-fold) in cold-exposed rats fed ad libitumcompared with controls (table 4). Pair-feeding cold-exposed rats to food intake levels of controls did not prevent the increase in Ang II receptor density. 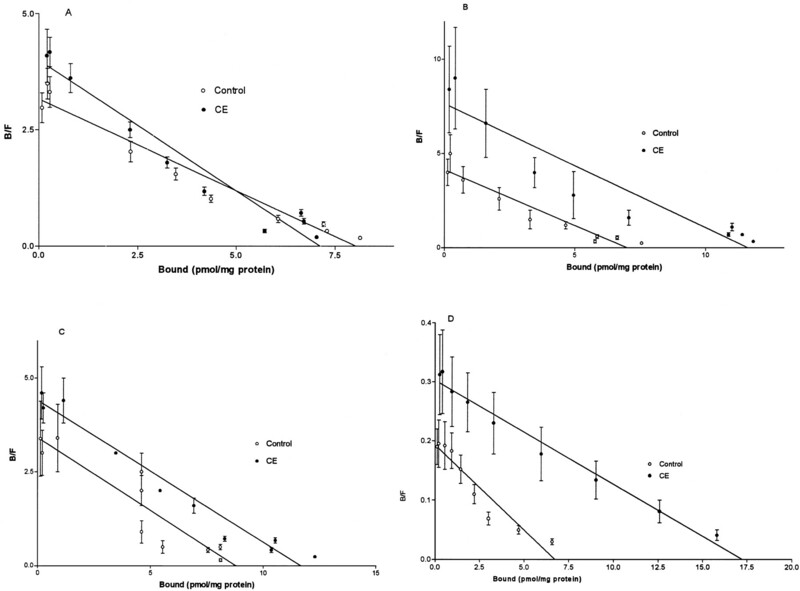 Ang II receptor binding density increased to a similar extent (2-fold) in ISBAT from both groups of cold-exposed rats (fed ad libitum, pair-fed) compared with control rats (table4). In kidney, the density of Ang II receptor binding sites was significantly increased over controls in pair-fed cold-exposed rats (table 4). There was no significant difference in Ang II receptor density in kidneys from cold-exposed rats fed ad libitumcompared with controls or between groups of cold-exposed rats (fedad libitum, pair-fed). Similarly, in left ventricle, Ang II receptor density significantly increased in pair-fed cold-exposed rats compared with controls (table 4). Moreover, Ang II receptor density in left ventricle from pair-fed cold-exposed rats was significantly increased compared with cold-exposed rats fed ad libitum. The present study clearly demonstrates that cold exposure regulates the systemic renin-angiotensin system, resulting in an increase in plasma angiotensin peptide concentration. Concentrations of angiotensin in the plasma of control rats from this study agree with reported values in the literature, ranging from 8 to 30 pg/ml (Simonet al., 1995). Moreover, characteristics of cold-exposed rats observed in the present study, including reductions in body weight, decreased plasma leptin concentration, increased plasma NE concentration, increased food intake, and increases in the mass of brown adipose tissue, are in agreement with previous reports in the literature documenting the physiological effects of cold exposure (Johnson et al., 1982; Giacobino, 1996). The time course for cold-induced increases in plasma NE concentration after cold exposure is well documented, demonstrating increases in the plasma concentration of NE as early as 30 min (Picotti et al., 1982) to 1 hr (Fukuhara et al., 1996a, 1996b) after cold exposure, which remain elevated as long as the exposure lasts. In contrast, angiotensin peptide concentration in plasma has not been previously measured after cold exposure. Alterations in plasma angiotensin peptide concentration in the present study included an immediate marked increase in plasma angiotensin after acute cold exposure that returned to base-line values within 1 day. The initial increase in plasma angiotensin concentration after acute cold exposure observed in the present study occurred in a time frame consistent with previously reported stimulation of sympathetic nervous system activity, suggesting that sympathetic activation may contribute to the acute increase in plasma angiotensin peptide concentration. Previous investigators have demonstrated that abrupt exposure to cold resulted in a rapid increase in mean arterial pressure within 45 min that was maintained over 24 hr (Fregly and Shechtman, 1994). Thereafter, mean arterial pressure progressively increased above levels observed in 24-hr cold-exposed rats to reach a level of 133 mm Hg after 7 days of cold exposure. The earliest time period of cold exposure examined in the present study was 4 hr. Thus, it is unclear from this study whether increases in plasma angiotensin peptide concentration are related to previously reported abrupt rises in blood pressure in cold-exposed rats. However, the marked increase in plasma angiotensin peptide concentration after 4 hr of cold exposure may contribute to early elevations in mean arterial pressure after cold exposure (Fregly and Shechtman, 1994). The initial increase in plasma angiotensin peptide concentration was not maintained and returned to normal within 24 hr despite continued cold exposure. Previous studies have demonstrated that mean arterial pressure remains elevated from 45 min to 7 days of cold exposure (Fregly and Shechtman, 1994). Thus, although increases in plasma angiotensin peptide concentration after cold exposure may contribute to an acute increase in mean arterial pressure, results from this study do not support elevations in plasma angiotensin peptides as the sole mechanism for initial elevations in blood pressure after cold exposure. In the feedback regulation loop for control of Ang II synthesis, the end-product peptide (Ang II) of the system acts at kidney AT1 receptors to inhibit further renin synthesis and release from the kidney (Peach, 1986). Thus, in the present study, plasma angiotensin peptide concentration may have returned to normal values at days 1 and 3 of cold exposure as a result of Ang II-mediated inhibition of subsequent renin synthesis and release. Interestingly, in the present study, plasma angiotensin peptide concentration again increased markedly after 7 days of cold exposure. Previous results from our laboratory suggested that plasma renin activity was not altered after 7 days of cold exposure (Cassis, 1993). In contrast, previous investigators reported that plasma renin activity tended to increase slightly after 7 days of cold exposure, followed by a decline to levels significantly lower than controls at 4 weeks of cold exposure (Fregly et al., 1991). These results suggest a dynamic interaction between plasma Ang II concentration and feedback regulation of kidney renin synthesis and release. Moreover, the resurgent increase in plasma angiotensin at 7 days of cold exposure in the present study suggests a potential role for Ang II in the maintenance of cold-induced hypertension. Interestingly, results from the present study demonstrate that increases in plasma angiotensin peptide concentration after cold exposure were primarily the result of increased concentrations of catabolic angiotensin peptide fragments. Of the angiotensin peptides resolved in the present study, Ang II, Ang III and Ang IV have known biological activity. Although plasma Ang II concentrations were not different between cold-exposed and control rats, concentrations of both Ang III and Ang IV were increased in plasma from cold-exposed rats. Thus, the physiological effects from increased plasma angiotensin peptide concentration after cold exposure may be mediated primarily by elevated concentrations of Ang III and/or Ang IV. Results from the pair-feeding study demonstrate that pair-feeding cold-exposed rats to food intake levels of control rats eliminated increases in plasma angiotensin peptide concentration. Thus, activation of the systemic renin-angiotensin system is dependent on cold-induced increases in food intake. These results are the first to demonstrate that food intake regulates plasma angiotensin peptide concentration. Previous investigators have demonstrated that cold-exposed rats increase their food intake to help maintain stimulated thermogenesis (Johnson et al., 1982). In agreement with previous studies, results from the present study demonstrate increases in food intake in cold-exposed rats fed ad libitum. Plasma concentrations of Ang II and NE measured in the present study were increased in parallel after cold exposure. Moreover, increases in plasma Ang II and NE concentration were eliminated in cold-exposed rats that were pair-fed to control levels. These results demonstrate that elevations in food intake in cold-exposed rats contribute to activation of the sympathetic nervous system and the renin-angiotensin system. Results from the present study clearly demonstrate that cold exposure regulates Ang II receptor density. In time course studies examining the effect of different periods of cold exposure on Ang II receptor binding characteristics, increases in Ang II receptor density in liver were evident within 24 hr of cold exposure. The time delay (4–24 hr) for cold-induced increases in Ang II receptor density suggests mechanisms related to de novo synthesis of Ang II receptor sites. The dissimilarity in the time course for the observed increase in liver Ang II receptor density and the time course for increased plasma angiotensin concentration does not support interdependency of these two variables. The sustained increase in liver Ang II receptor density in the face of a return to normal plasma angiotensin concentration in cold-exposed rats demonstrates regulation of Ang II receptor density independent of angiotensin substrate concentration. Several laboratories have examined substrate-mediated regulation of the Ang II receptor. Using cell culture systems, chronic Ang II exposure decreased Ang II receptor density (Makita et al., 1992). In addition, aortic coarctation and unilateral ureteral obstruction, both of which resulted in stimulated renin secretion and increased Ang II formation, inhibited AT1 mRNA expression in the affected kidney (Pimentel et al., 1994; Tufro-McReddie et al., 1993). Moreover, chronic infusion of Ang II in rats resulted in a decrease in Ang II receptor density in heart and kidney (Sun and Weber, 1993). In the present study, despite elevations in plasma angiotensin concentration, an increase in Ang II receptor density was observed in several tissues from cold-exposed rats. Cold-induced increases in Ang II receptor density in the present study may have resulted from substrate-mediated up-regulation of Ang II receptor density or may be independent of plasma angiotensin concentration. However, these results do not support substrate-mediated down-regulation of Ang II receptor density in response to elevated plasma angiotensin concentration. Increases in Ang II receptor density were paralleled in ISBAT, a tissue relevant to the maintenance of body temperature after cold exposure. Previous investigators have demonstrated a marked increase in turnover of NE in ISBAT after cold exposure, contributing to the maintenance of nonshivering thermogenesis (Young and Landsberg, 1982). Previous studies in our laboratory have demonstrated that after 7 days of cold exposure, Ang II content in ISBAT is increased (Cassis, 1993). In addition, the presynaptic effect of Ang II to facilitate NE release from slices of ISBAT was enhanced in cold-exposed rats (Cassis, 1993). Increases in Ang II receptor density in ISBAT from 7-day cold-exposed rats in the present study may contribute to the enhanced presynaptic effect of Ang II after cold exposure. In the present study, cold exposure did not significantly increase Ang II receptor density in lung. Thus, cold exposure regulates Ang II receptor density through tissue-specific mechanisms. Previous investigators have demonstrated that the AT1 receptor is the predominant angiotensin receptor subtype present in liver, lung and ISBAT (Kitami et al., 1992; Cassis et al., 1996). In kidney and left ventricle, both the AT1 and AT2 receptor are present (Chang and Lotti, 1991; Kitami et al., 1992). 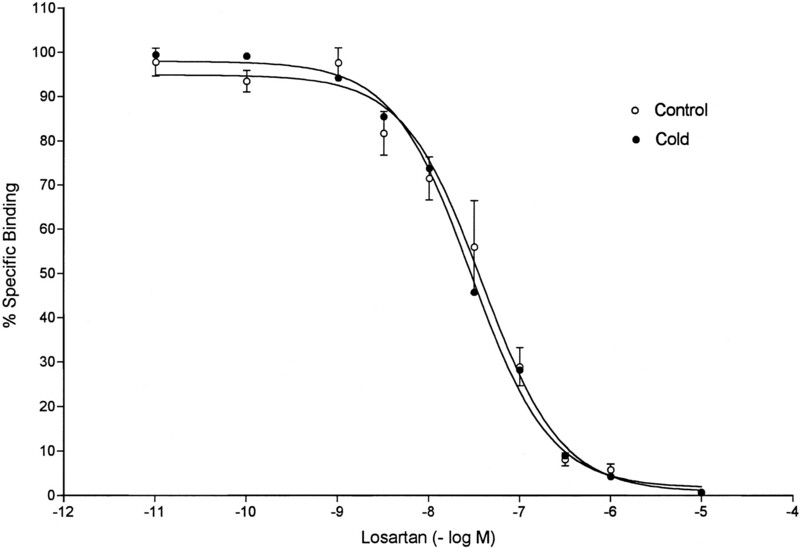 In the present study, losartan, used in a concentration range specific for AT1 blockade, displaced 100% of radioligand binding in livers from cold-exposed and control rats. These results demonstrate that cold-induced alterations in angiotensin receptor density in rat liver are specific for the AT1 receptor subtype. Given that the lung also contains predominately the AT1 receptor subtype, reasons for a lack of cold-induced regulation of Ang II receptor density in this tissue appear to be unrelated to the Ang II receptor subtype distribution. Interestingly, cold exposure did not result in a significant increase in Ang II receptor density in kidney and left ventricle, the two tissues examined as Ang II target organs with cardiovascular relevance. However, Ang II receptor density increased in kidney and left ventricle when cold-exposed rats were pair-fed and were evident despite normalized plasma angiotensin concentrations in pair-fed rats. Mechanisms for tissue-specific regulation of Ang II receptor density by cold exposure and restricted food intake were not identified in the present study; however, results demonstrate that cold-induced regulation of Ang II receptor density in kidney and left ventricle occurred independent of plasma angiotensin concentration. In summary, results from this study demonstrate that cold exposure regulates the systemic renin-angiotensin system, coincident with activation of systemic sympathetic nervous system activity. Moreover, cold exposure resulted in a tissue-specific increase in Ang II receptor density. The time course for cold-induced increases in plasma angiotensin concentration did not coincide with the time course for alterations in liver Ang II receptor density, suggesting regulation of Ang II receptor density was not substrate-mediated. Moreover, pair-feeding cold-exposed rats to food intake levels of control rats prevented increases in plasma angiotensin and NE concentration but did not prevent tissue-specific increases in Ang II receptor density. Results from these studies do not support substrate-mediated regulation of Ang II receptor density in response to cold exposure. Collectively, these results demonstrate that cold exposure is a model for systemic activation of the renin-angiotensin system and regulation of angiotensin receptor density. The authors acknowledge the University of Kentucky Veterans Administration research facility for use of the animal hibernactim for cold exposure studies. Send reprint requests to: Lisa A. Cassis, Ph.D., Room 417, College of Pharmacy, Division of Pharmacology and Experimental Therapeutics, University of Kentucky, Lexington, KY 40536-0082. ↵1 This work was supported by the National Heart, Lung and Blood Institute Grant HL52934. (1995) Measurement of plasma angiotensin peptides (Letter to the Editor). Hypertension 26:843–845. (1993) Role of angiotensin II in brown adipose thermogenesis during cold acclimation. Am J Physiol 265:E860–E865. (1996) Characterization and regulation of angiotensin II receptors in rat adipose tissue. In: Recent Advances in Cellular and Molecular Aspects of Angiotensin Receptors, ed. by M. Raizada, et al., pp. 39–47, Plenum Press, New York. (1991) Angiotensin receptor subtypes in rat, rabbit and monkey tissues: Relative distribution and species dependency. Life Sci 49:1485–1490. (1973) Relationship between the inhibitory constant (Ki) and the concentration of inhibitor which caused 50% inhibition (pIC50) of an enzymatic reaction. Biochem Pharmacol 22:3099–3108. (1989) Development of hypertension in rats during chronic exposure to cold. J Appl Physiol 66:741–749. (1993) Effect of chronic treatment with losartan potassium (DuP 753) on the elevation of blood pressure during chronic exposure of rats to cold. Pharmacology 46:198–205. (1994) Direct blood pressure measurements in rats during abrupt exposure to, and removal from, cold air. Proc Soc Exp Biol Med 205:119–123. (1991) Changes in blood pressure and dipsogenic responsiveness to angiotensin II during chronic exposure of rats to cold. Pharm Biochem Behav 38:837–842. (1996a) Interrelationships between sympathoadrenal system and hypothalamo-pituitary-adrenocortical/thyroid systems in rats exposed to cold stress. J Neuroendocrinol 8:533–541. (1996b) Effects of continuous and intermittent cold (SART) stress on sympathoadrenal system activity in rats. J Neuroendocrinol 8:65–72. (1996) Role of the beta 3-adrenoceptor in the control of leptin expression. Horm Metab Res 28:633–637. (1982) Restricted food intake limits brown adipose tissue hypertrophy in cold exposure. Life Sci 30:1423–1426. (1992) Differential gene expression and regulation of type-1 angiotensin II receptor subtypes in the rat. Biochem Biophys Res Commun 188:446–452. (1961) Excretion of catecholamines in rats exposed to cold. Acta Physiol Scand 51:94–100. (1995) Influence of tissue freezing on the binding of 125I-sarcosine1, isoleucine8 angiotensin II to angiotensin II receptor subtypes in the rat. J Pharmacol Toxicol Methods 33:83–90. (1991) Role of the sympathetic nervous system in cold-induced hypertension in rats. J Appl Physiol 71:300–306. (1992) Two distinct pathways in the down regulation of type 1 angiotensin II receptor gene in rat glomerular mesangial cells. Biochem Biophys Res Commun 185:142–146. (1986) Pharmacology of angiotensin II. Kidney Hormones III:273–308. (1982) Plasma catecholamine concentrations in normotensive rats of different strains and in spontaneously hypertensive rats under basal conditions and during cold exposure. Life Sci 31:2137–2143. (1994) Regulation of the renal angiotensin II receptor gene in acute unilateral ureteral obstruction. Kidney Int 45:1614–1621. (1928) Influence of application of cold or heat to the dog’s body on the epinephrine output rate. Tohoku J Exp Med 11:544–567. (1991) Prevention of cold-induced increase in blood pressure of rats by captopril. Hypertension 17:763–770. (1995) Pressor and subpressor angiotensin II administration: Two experimental models of hypertension. Am J Hypertens 8:645–650. (1993) Angiotensin II and aldosterone receptor binding in rat heart and kidney: Response to chronic angiotensin II or aldosterone administration. J Lab Clin Med 122:404–411. (1993) Decreased perfusion pressure modulates renin and ANGII type 1 receptor gene expression in the rat kidney. Am J Physiol 264:R696–R702. (1982) Diet-induced changes in sympathetic nervous system activity: Possible implications for obesity and hypertension. J Chronic Dis 35:879–886.